Welcome to another week of my guest post series Other Bloggers Family Lives. This week I am featuring Jess from Babi A Fi a blog that I only discovered a few months ago but now read all of the time. 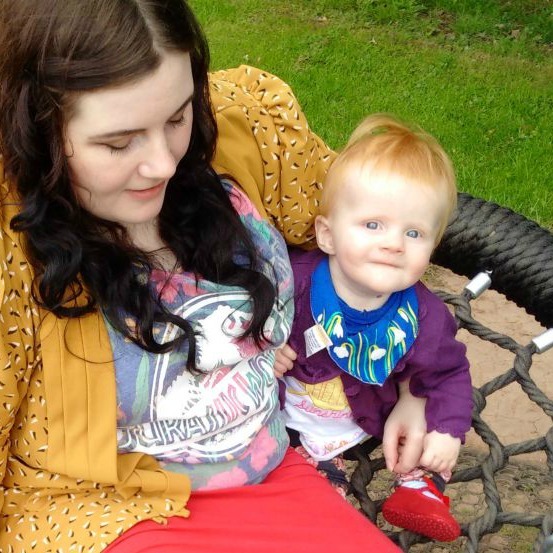 Jess's blog is full of blogging tips, reviews and life with her adorable little girl Marianna. So lets find out more about the family behind Babi a Fi. My name's Jess, I'm 27, and I share my life with Marianna - 15 months and already living the terrible twos - and my long suffering partner, Anthony. There is a lovely walking route laid out alongside the Afon Llywd river about ten minutes away from our house. It leads to a skate park and Cwmbran boating lake, with a big children's play park. I also love taking Marianna to Greenmeadow Community Farm to see the animals. I would love to visit lots of places. I've never been to the USA, and I have my heart set on making it to Japan some day. I wouldn't really want to live anywhere else but Wales though. I did - my mum and dad live just three streets away from us. We moved around a fair bit before moving to that house, but it was always in the same town. Cwmbran was - and is! - a great place to grow up; it has lots of amenities right on the doorstep, and I have lots of great memories of visiting parks, climbing mountains, cycling alongside the canal, and, like any 21st century gal, playing video games in my bedroom. I'm most excited this year for Christmas. (I know, already!) Marianna didn't really have a clue what it was all about last year, but we're planning lots of special things for this year. I love all the little things. The smiles, the cuddles, and those fleeting moments where all is right with the world. I wouldn't trade it for anything. Thank you so much for taking part Jess I loved reading your answers, I am excited for Christmas too this year as I think my little two will be super excited. I hope that you get to visit Japan someday soon and enjoy all the precious cuddles and smiles with Marianna whilst she is small (love her name by the way). if you missed it. If you would like to take part in Other Bloggers Family Lives then please send me an email at Newcastlefamilylife@gmail.com , you don't need to be a parent to take part either as the answers can be easily adapted. Like Jess, I'm also excited for Christmas! I'm excited about decorating our new home with all the Christmas decorations. I know, how sad is that? It's not even summer yet! I love finding out more about the blogging community - thank you! Great that Jess is blogging and working as a Councillor - I know the day job can be sooo consuming, well done, lovely interview. This interview was a great read. I enjoy reading about other bloggers. I can totally relate to Christmas becoming more and more meaningful. Seeing the excitement in their eyes. Can't wait either! This is so cute - I love how you are so patriotic about Wales (in fact all of the Welsh people I know are super proud to be Welsh). Hope you get to Japan one day, that would be such an adventure! Great feature :) I love Jess' blog too, and I agree, Cwmbran is a pretty awesome place!